The SVA movement is helping influence the future of volunteering while building social cohesion, resilience and empathy. Civic participation is fundamental to healthy communities. The SVA Foundation is focused on supporting people to engage their communities and bridge social gaps. Christchurch was struck with a 7.1 magnitude earthquake on the 4th of September 2010. 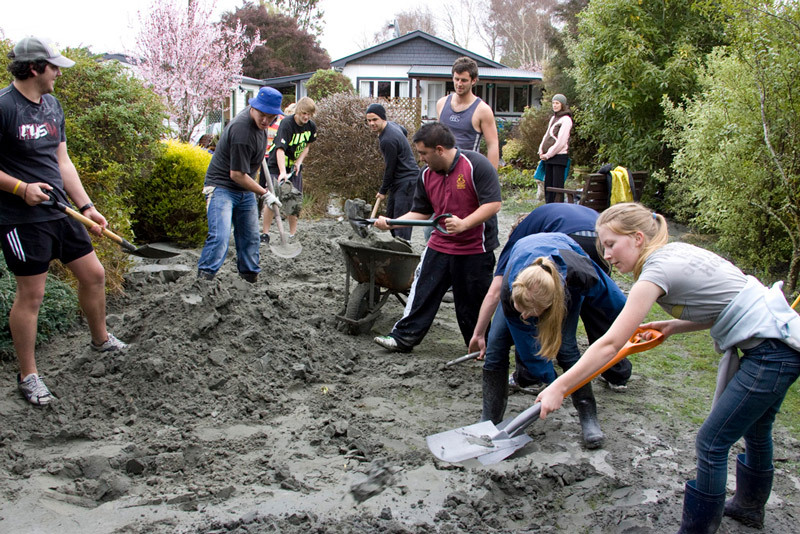 In response to this natural disaster, University of Canterbury student, Sam Johnson, created a Facebook group called the Student Base for Earthquake Clean Up’ to assist local residents with non life-saving tasks, in particular removing liquefaction around Christchurch. Support for the group skyrocketed and more than 2,500 student volunteers arrived in force to clean-up of over 65,000 tonnes of liquefaction. Sam worked with the University of Canterbury to maximise this momentum, and from this came the Student Volunteer Army (SVA). Canterbury was rocked again by a 6.3 magnitude earthquake on the 22nd of February 2011. The damage from this quake was far greater and resulted in the tragic loss of 185 lives. The SVA dispatched thousands of volunteers within a three week period to assist communities in need. Up to 450 car-loads of students were allocated using a mixture of software, texting, and Google mapping. Street teams managed volunteer engagement for various organisations, including multiple government departments, Civil Defence and the Christchurch City Council. The SVA has since been instrumental in mobilising youth around the world to provide disaster relief. The SVA helped Japanese university students develop a similar programme 2011 following the Japan earthquake and tsunami, and provided support to New York during the Hurricane Sandy relief effort. Back in New Zealand, the SVA has provided support and assistance following many emergencies and events such as the Kaikoura earthquake, Christchurch Port Hills fires, and the terrorist attack in Christchurch in March 2019. The SVA is a multi-faceted movement and has expanded beyond its university origins to involve people of all ages from throughout New Zealand. Our SVA School Program provides teachers with everything they need to mobilise classrooms to identify issues in their community, work on solutions, and reflect on what they learned. The SVA High School Service Award enables and deepens high school volunteering activity. Community Guardians is an extension of the SVA and Citycare into the wider community. It involves a range of initiatives designed to empower local people to volunteer on an ongoing basis in helping manage and maintain their local parks and community halls. Live Life is a unique programme that harnesses the power of the community to support young people make positive life choices, enabling them to maximize their potential and attain health, academic, career and personal goals. The UC SVA is an incorporated society operated by an executive of 30 University of Canterbury students. The goal is to create events that inspire students to continue to volunteer throughout their university career and beyond.